Several NAUW Branches spread their Christmas cheer in various parades this year. Director Alice McClam made an appearance in the Clayton Christmas parade in Clayton, NC. Also present were the Clayton Branch Woman of the Year Pamela Smith. 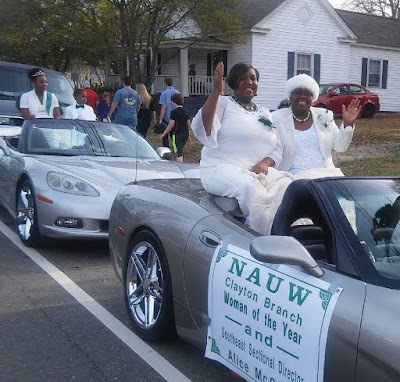 In the convertible behind was their "2015 Green and White Ball King and Queen" - Jaquan Barnes and Kamia Atkinson. Looking lovely in "Green and White" and wishing everyone a "Merry Christmas". 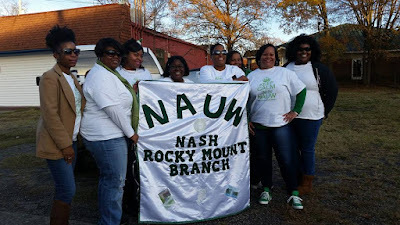 The Nash-Rocky Mount Branch Sisters made an appearance in the Rocky Mount Christmas Parade in Rocky Mount, NC. The branch passed out candy and shouted NAUW and Christmas cheers. If your branch participated in a parade or holiday celebration, please email pictures to goodbye27823@yahoo.com, so that we can feature your branch. Merry Christmas and a Happy New Year from the Southeast Section!